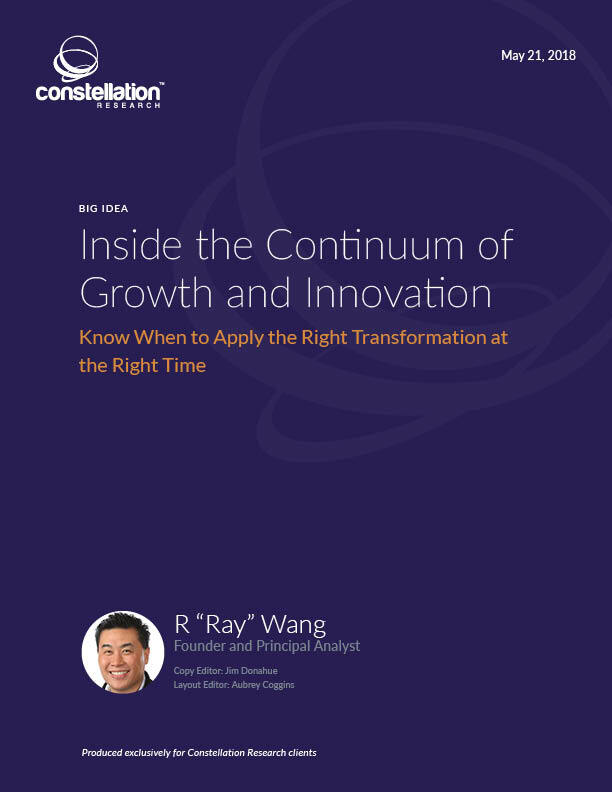 Inside the Continuum of Growth and Innovation | Constellation Research Inc. The pressure for digital transformation in the boardroom has led executives to jump into their digital journeys. Fail fast, fail often and learn equally fast remains the mantra. While digital transformation is game changing and the key to survival for many CEOs, boards often fail to understand that the right approach to heavily depends on where the organization is in the continuum of growth and innovation. Great boards and leaders understand that form follows function. The right strategy must be applied to the right the phase of continuum in order to succeed in digital transformation. Constellation’s model for the continuum of growth and innovation provides a framework for assessing organizational state and jumpstarting growth through digital transformation while understanding when to focus on which phase in the continuum.